Since we're on the subject of tractors, let's talk about getting them fixed. A large company will have its own shops and mechanics at the terminals...at least at some of the terminals. A small company may have their own shop or they may have a local shop nearby that does all of their work for them. Unfortunately a lot of diesel mechanics don't get paid very well and it's not uncommon to wait a day or two to even get the tractor into a shop, whether it be one of your company's shops, a general repair shop on the road, or an actual truck dealership. The mechanics aren't usually in much of a hurry (I'm actually being pretty nice here) and the shops get pretty backed up with work. Getting repairs done is one of the most frustrating aspects of life on the road. You are usually get paid by the mile or by the load so sitting there waiting for your truck to get fixed isn't making you any money. Now most companies will give you a little bit of money for food and layover time and will pay for your motel if you need one, but usually they'll give you just enough money to eat and drink your sorrows away. In the end you're often left with nearly nothing. Getting repairs done is one of the most frustrating aspects of life on the road. My general rule of thumb for getting major repairs done on the road was to tell your company you're going to need a hotel....trust me, you usually will. Now small repairs like an alternator or starter, tire changes, lights, and things of that nature will usually get done within a few hours while you wait. But if the truck quits running and needs to be towed or the repair is going to be something major just expect to spend the night in a motel. Relax, get a nice shower, watch some TV, walk to a nearby bar if you like, order a pizza, get an awesome night's sleep, and be prepared to get back to running hard the next day. Your life won't be ruined if you lose a day or two for repairs. You can easily make up those lost miles in the coming days and weeks. But a nice relaxing 24 hours in a hotel can be incredibly refreshing. Take advantage of it. The company is paying for it anyways. Enjoy yourself. It's a great excuse to do nothing. 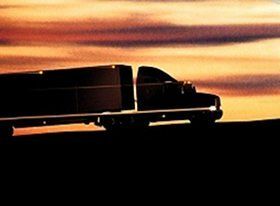 Now many large companies will have accounts set up with truck stops to get work done. I've found that it's usually much, much faster to get small repairs done on the road than it is at your company's terminals. Especially oil changes, known as PM's (preventive maintenance), and small repairs like tires, alternators, lights, etc. Often times you can pull in without any wait whatsoever and an hour later you're rolling again. While you wait, go into the truck stop, take a shower, get a good meal, catch up on your paperwork, and get yourself ready to roll when the truck is finished. Often times the truck stops will offer you a free shower or meal while you're getting the work done so ask them. Now, not only is the work getting done faster at the truck stops but you even get free stuff while they're doing it. Bonus! Efficient use of your time on the road is key. The more driving you do the more money you make so make good use of your down time so you can focus on driving when the truck and the freight are available. As a driver you must be aware of how your actions affect your company, but keep in mind that YOU have the hardest job of anybody, so you have to look out for yourself. Talk with your maintenance department and find out all of their procedures. They will tell you they prefer to do the work in their own shops instead of on the road but it isn't the mechanics, maintenance supervisors, and office managers that are losing time, money, and being inconvenienced while you're waiting for them to do the work, its you. As a driver you must be aware of how your actions affect your company, but keep in mind that YOU have the hardest job of anybody, so you have to look out for yourself. If you enjoy the idea of getting a hotel once in a while or you can make better use of your time by getting the work done at a truck stop then do it. It won't happen too often anyways and it can make a big difference to you. Besides, if you're happy, well-fed, and well-rested you're going to be a harder-working, safer driver so helping yourself can also be helping your company at the same time. They often aren't going to look at it that way, but they've never lived on the road, so they really wouldn't know would they? Exactly.